Accelerates blood flow and circulation and strengthens skin tissue metabolism. 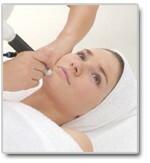 Diamond Dermabrasion can also be used on: - face, neck, shoulders, back, & arms. Reduction of age (liver) spots. Minimization of blotchy skin coloring. Reduction of acne and superficial scars from past injury. 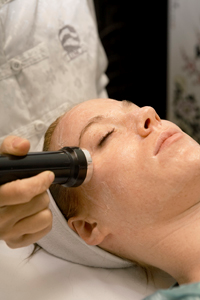 5) - Ultrasonic Anti-Ageing Wrinkle Treatment - Ultrasound skin rejuvenation is the latest advanced technology for the face and neck which accelerates the absorption of professional skincare products. When professional skincare products are applied the Ultrasonic function "pushes" the professional skincare products into the deepest skin layers for maximum absorption and skin rejuvenation resulting in a more radiant looking skin. Infuses skin care products deep into the skin.